Timetoast is a website dedicated to timelines. Students can create and share timelines on the web for FREE. Creating a timeline is very easy and straightforward. 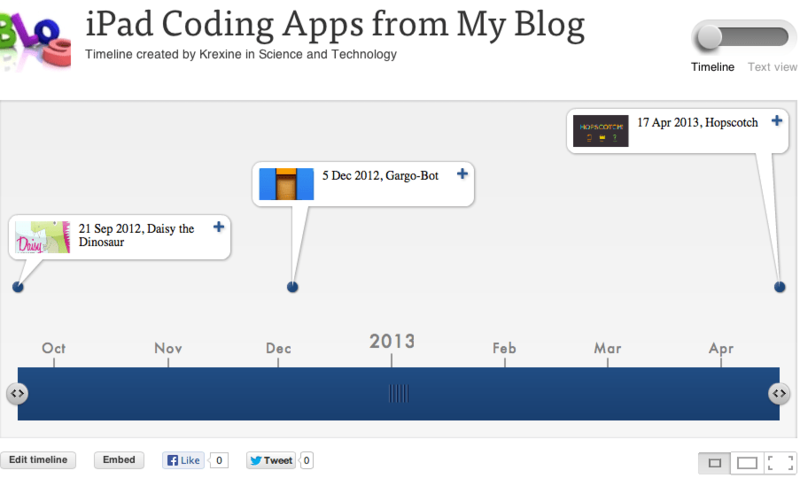 Below I created a simple timeline about when I blogged about coding apps for the iPad. Students can add links, pictures, and text to any timeline they create. As an elementary teacher you could use this for student goal setting. NWEA(MAP) data, NDSA data, or reading level data are some ideas that come to mind. You could also create a class timeline so you could do back during the last month of school and review or look back on what the class has done or accomplished. Click on the image below to view my quickly created interactive timeline from Timetoast.